We are ankle deep in wintertime projects here on Ocracoke Island. This is dream-time on the Outer Banks . . . a time when island residents enjoy friends and family and begin to construct the next season's activities. 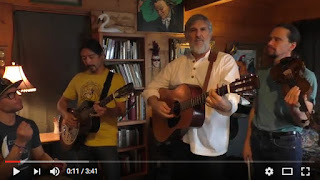 Fiddler Dave is currently traveling with his family on the west coast, Gary has been working on new songs and video projects, Gerald is carving away at instruments in the middle of the state, and Kim has been honing her classical chops in the mountains. Gary has a new song! https://youtu.be/MP_Qb3OOrt8. Lou Castro and Jubal Creech are special guests on the song, along with Gary, Fiddler Dave & Gerald (Kim was in the midst of concerts in the mountains, so Gerald filled in on bass). If you like the message, please spread it around! It's official! The 2017 season at Ocracoke Alive's Deepwater Theater has been unveiled. We begin shows in June (maybe a few teasers in May). 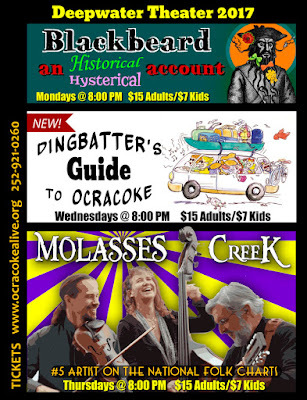 Of course, Molasses Creek will return for shows on Thursday nights, and Blackbeard: An (Historical/Hysterical) Account will return for a second season on Mondays. A brand new venture, A Dingbatter's Guide to Ocracoke Island, is making its debut on Wednesday nights. Catch the gang from Hysterical Blackbeard (Fiddler Dave, Gary, Desiree Ricker, and Peyton Piquard), for the ultimate guide for Ocracoke visitors. This new show answers the most burning questions . . . What really happens on the island in the off season? How can you sneak home your own piece of the island? What is a Russian Rat? . . . and more! To find out more and reserve your tickets ahead of your visit to Ocracoke, click on the link above.